We love index funds here at The College Investor, and we’ve recommended several in our Guide to Investing. However, there’s a new type of index fund that is gaining in popularity, and one that I think has a lot of merit – equal weighted index funds. What is an Equal Weighted Index Fund? Let’s use the S&P 500 for this example. You know that the S&P 500 is composed of the 500 largest stocks in the United States. So, as you can see, there is a much larger percentage of the fund in several stocks, which can skew returns if these stocks perform well or poorly. In fact, that happened last week with Apple – many broad index funds were up much higher than the market, simply because of the weighting of Apple and Microsoft in their portfolios. Let’s look at what equal weighting does. One of the most popular equal-weighted funds is the Guggenheim S&P 500 Equal Weighted ETF (RSP). If you look at the holdings of RSP, all of the stocks in the fund are at 0.22%, since the fund is equal weighted. This changes the dynamic of the performance of the fund, since no single holding can overtake the others, and performance is equalized. The balance that you get with an equal weighted index fund really comes into play when you chart out performance over time. Here is a side-by-side comparison of SPY and RSP over the last decade. The red line is RSP, the equal weighted portfolio, and the blue line is SPY, the standard capitalization weighted portfolio. Over the last decade, RSP has returned 82.49% vs. 64.41% for SPY over the same period. The key to this success is balance. At the top, no single holding that may underperform can drag the portfolio down, while at the bottom, faster growing stocks get more weight than in a capitalization-based index. This allows for more growth, similar to what you see in small or mid cap funds. The biggest drawback to equal weighted index funds are higher expense ratios. These funds have higher expenses because they have daily costs of maintaining balance in their portfolio. While an ETF like SPY will only trade when major changes happen, equal weighted funds have to continually trim overweighted holdings to maintain the balance. Think of it like a daily portfolio rebalancing act. The second big drawback to equal-weighted funds is that the gap in performance vanishes as you move from large cap funds to mid and small cap funds. In fact, the equal-weighted index funds are basically even at the mid cap and underperform at the small cap level. Here, we look at the Guggenheim Russell MidCap Equal Weight ETF (EWRM) vs. the iShares Russell MidCap ETF (IWR). You can see over the last 5 years (total time of fund’s existence), performance of the two funds has basically been even, with a slight underperformance of the equal-weighted fund. Over the period, EWRM returned 60.30% vs. 63.53% for IWR. Here, we look at Guggenheim Russell 2000 Equal Weight ETF (EWRS) vs. the iShares Russell 2000 ETF (IWM). 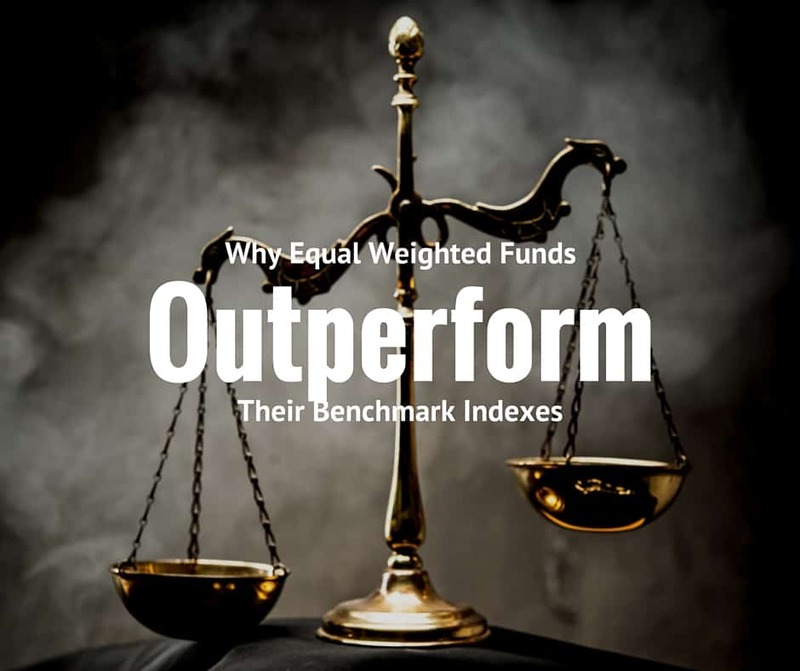 You can see that the equal weighted fund actually underperformed the benchmark index in this case. Over this period, ERWS returned 34.45% vs. 50.94%% for IWM. That is over 15% underperformance, not including the higher expense ratio. Finally, it’s important to keep in mind the higher expenses when investing in equal weighted index funds. Here are the most popular equal weighted index funds, in case you’re interested in investing. What are your thoughts on equal weighted index funds? Do you invest in these in your portfolio? Great information, I learned something new! Wow, very nice and detailed overview. I’m a huge fan of index funds as well, but I haven’t done much research on the equal weighted ones. It looks like they could be a great alternative. I’ll have to check it out. That is a good article, outlining equal weighted investments vs market cap weighted. For S&P 500 however, i was not certain if equal weight outperformed prior to 2003? I think you have a great point on not relying on past performance. For me, I think of the future performance of the overweighted holdings in the cap-based funds, and it makes sense that the equal-weight funds should continue to outperform. The growth won’t be in Apple, Mircosoft, and Exxon. While they could do well, they won’t grow as much as some of the smaller holdings. Interesting concept and well done Robert! I have most of my money with Vanguard for the very reason that higher expense ratios can have a major impact on performance. Most actively managed funds underperform index funds partly because of the expense involved. I wasn’t aware of equal weighted index funds. These will be something to consider when I make more investments. Once I get into serious investing it will be in index funds. Equal weighted funds are brand new to me and this was a fantastic overview. Thanks! This looks like a good idea. Currently I am balancing my investments based on income they generate and have equal allocation based on income (dividends), so if one stock fails, I lose only a portion of my income and not a significant portion. Earlier, for example I had 40% of all income from one stock and the rest was among the remaining stocks. When that stock cut the dividends, I suffered a significant income. So I am balancing based on income as much as possible. I fear this point may negate all other findings over an investors lifetime. I wouldn’t jump to that conclusion. The expense ratios are only 0.40% vs 0.10% for a good ETF. I don’t think it’s close to a point where you should be concerned too much. Very interesting post. I have always tilted from the large-cap bias of the Vanguard US Total Stock Market ETF (VTI) toward holdings with small-cap value using the Vanguard small-cap value ETF (VBR). Having 50% of my US equities in VTI and 50% in VBR has been a very good thing.